This is one heck of a cool set. For those who need to catch up on the earlier part of REO's catalogue (you know, before they were superstars), it's really a great value. Packaged in a killer cardboard case, this has the first six studio albums (all on individual discs with mini-record cover sleeves) along with the band's first live album (on two CDs) for a total of eight discs. There are some bonus tracks on all the studio discs (mostly mono singles). Rounding it all out is a great informative book. While the lineup of the band in the hits era was fairly well set, there was a lot more flux (in terms of singers) in this earlier period of REO's history. The singer on the first album was Terry Luttrell (best known for his work in Starcastle later). Kevin Cronin shows up on the second album, but then left during the recording of the third. He was replaced by Mike Murphy who recorded with them for three albums. Cronin returned for the final studio album of this set along with the live disc. The core instrumental grouping of Gary Richrath (guitar), Neil Doughty (keyboards) and Alan Gratzer (drums) remained the same from the first album through the later hits era. Gregg Philbin handles the bass on all the music here, but was replaced after this period by Bruce Hall. I am going to make a few points here which are probably going to be a bit controversial. First, for me this period of the band was more vital and interesting than the later hit dominated era. Secondly, I think Murphy was a stronger and more rock and roll singer than Kevin Cronin, but Cronin has become the trademark voice of REO Speedwagon in a large part because of his long tenure and the visibility of the band during that era. Don't get me wrong, he gets the job done. I just prefer Murphy's sound. The final un-popular opinion I am going to put out there: Lost in a Dream is the best REO album. It really was the first album to feel polished enough and consistent enough but without losing the real rocking edge. Whether you agree or disagree with any of my statements here, though, if you like REO and don't have the early albums, get this. It's a classy package that is a great value. This is a hard rocking tune that works well. It's far removed from the pop rock sound that the band would embrace years later. It's more tied to the bluesy hard rock of the era. It's a meaty musical texture that works well, but it does sound a bit generic. The instrumental jam is pretty cool stuff. I dig the piano based stuff that rises up from there. 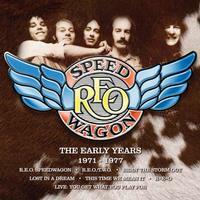 This early version of the REO classic is a killer rock and roller. It has some smoking hot piano playing, and in general is on fire. The piano is a big part of the sound of this rocker, too. It's a pretty mainstream tune that works well. As you might guess from the title, this one is a political number. Gary Richrath is on fire in the guitar solo. Another hard edged rocker, the guitar work on this thing really shines. There are some signs of the REO sound that was to come on this in a lot of ways. It's a catchy rocker. This isn't a huge change in terms of the song proper, but the guitar solo on this is absolutely on fire. It's a high energy stomper that's very cool. I dig the bass work on this thing. Here they take us into some decidedly folk rock meets psychedelia territory. This is a big change from the sound one expects from REO Speedwagon, but it's an intriguing cut. I like it a lot. It's another topical song. For some reason this makes me think of the band White Witch just a bit. Now this has a real REO Speedwagon sound. It is energetic and a lot of fun. I dig the guitar solo on this a lot. Now this is so cool. It's hard rocking and feels almost dangerous. There is a healthy helping of psychedelic rock on board, but even hints of heavy metal. This hard rocking song is probably my favorite song on this first disc. Terry Luttrell sounds more like what he would later sound like with Starcastle than anywhere else on the disc. The only part of this I don't really like is the drum solo, but I am just not a fan of drum solos in general. When they fire out of that with the killer soaring rocking section, it's purely on fire. At over ten minutes of music, this is a real epic. The parenthetical tells you what you get here. And here there is no surprise either. The final bonus track is another single. Good time rock and roll more like the kind of sound one expects from REO, this is a great opening number. It's high energy and catchy. It is also obvious from the start that the sound quality and production on this disc are better. Richrath shows off his incredible skills on this song, too. Another high energy rocker, this is classy stuff, too. It's not as strong as the opener, though. I do love the crunchy edge to the guitar sound. The saxophone on this is a nice touch. This is more indicative of the kind of good times rock and roll that would later be the mainstay of this band. It has some killer piano work in an instrumental section mid-track and just really works particularly well in general. It is, of course, a cover of a Chuck Berry tune. Synthesizer is prominent in the introduction of this cut. The tune works out to a dramatic balladic texture. It has a lot of prog rock built into it, really. There is a harder rocking movement later in the track that really manages to power it up nicely. More of a classic REO sound drives this fast paced number. This is one that has shown up in their set lists quite a bit over the years. There is some exceptional bass work on this, but then again, everyone really rocks it. Another energized rocker, this is more of a classic REO sounding number. It's a catchy and fun. It has some cool instrumental work, too. I really love the powered up, pull-out-all-the-stops closing movement. This song is catchy and solid. It's just not a real standout by any means. It certainly has some hook and some energy, though. I dig the organ soloing and, of course, the guitar soloing. Now, this is probably my all-time favorite REO Speedwagon song. It's one that has been a mainstay for the band's live shows over the years, too. It is such a killer building rocker. The message of the song is just as relevant today as it was the day it was written. There is a real proggy texture to this piece. The balance between the mellower sounds and the harder rocking ones is so cool. The transitions are perfect, too. This has a great mix of meaty rock and catchy hooks. It's all delivered with real style, too. Richrath puts in some of his most expressive and inspired guitar soloing on this tune, as well. It all builds into something that is pure magic. As you can guess from the parenthetical, this is a mono single version of the earlier tune. It works well in this format, too. I dig the synthesizer that opens this cut. I know a lot of people are more familiar with the live version of the song. That rendition is a bit faster and higher energy. The thing is, the tune still works well like this. The guitar soloing on the fade out is so cool. Here we get more of a slow bluesy rocker. There is some cool channel separation on the introduction. It gets into more of a mainstream hard rock zone as it continues. This is another song that makes me think of White Witch a bit. I love the keyboard dominated break later in the piece. A high energy mainstream rocker, this is a lot of fun. It's catchy and meaty and just so cool. Richrath is the lead singer on this tune, and he puts in a great performance. It's a mid-tempo melodic rocker that's classy stuff. There's an extended organ solo on the number. A high energy number, this is another melodic one. It is another that makes me think of White Witch a bit. I dig this number a lot. It has more of a meaty rock sound than the last couple songs did. The female backing vocals are a nice touch. We get another cool keyboard solo on this tune. Another classy rocker, this is quite effective, but not necessarily a standout tune. More of a melodic rocker, this is definitely not as strong as some of the rest. It does provide some variety and has some good guitar fills, but it's one of the weaker points of this particular CD of the set. While this tune is solid, other than the guitar solo section it doesn't really stand out that well. A mellower cut, this is another that just seems a bit lackluster. It gets more powerful as it moves forward. Here we have the single version of the title track. Another single version, this isn't a big surprise. Here is a version of the title track with Kevin Cronin's original vocals. It makes it feel closer to the live version everyone recognizes. Here we get the alternate version of this number. It sounds more like trademark REO to me, but I think the other vocals rocked a bit more. I love the energy and vibe of this little rocker. It's a lot of fun. It really feels like classic REO in a lot of ways. In fact, it's one of my favorites of the set. Richrath's guitar soloing just oozes "cool." Another killer rock and roller, I love the vocals on this tune. They really rock. The whole tune is a powerhouse rocker. It has some definite REO elements, but is a lot more of a blues rocker. It's also on fire. Here we get more bluesy rock, but you probably gathered that from the title. While this is perhaps not as potent as the first couple tunes, the soulful edge is a nice touch. Coming with a mellower, keyboard driven arrangement, this works out to more rocking stuff from there. This has some similar musical territory to "Golden Country" and is similarly proggy. There is some funk and some soul in the mix, too. The title track has a cool groove to it. It's full of drama and magic. It's a mid-tempo tune with some soulful bluesy texture. The guitar sound has some particularly meaty moments. This is a very strong tune that really rocks. The instrumental movement is purely on fire. This cut feels a lot like the later REO sound. It's another high energy rocker that manages to be both meaty and catchy. I love the guitar fills on this, and the whole cut is just exceptional. Starting tentatively, this works out into some bouncy, fun rocking sounds. It's a classy tune that works really well. That said, I don't really think of it as a standout. It has a bit of the White Witch texture we haven't heard before on this CD of the set. This starts with some seeming in studio confusion. It works out to a number that's trademark REO Speedwagon. Pop rock oriented and classy, it's a melodic rocker that's a lot of fun. A middle of the road pop rock tune, this is good, but nothing special. It's arguably the one truly forgettable tune on this particular album of the set. I dig the bouncy, catchy mainstream rock sound of this tune. It has some great hooks and a lot of energy. I'm sure you know what you get here. I dig the piano on the fast paced opening section here. This tune is a killer bluesy rocker that's so classic in tone and texture. Melodic rock and a decidedly REO sound are on display here. There also valid reference points to another Champaign based band, Head East, on this tune. This is another melodic rocker. It is a bit mellower than the two openers. I don't think it's as successful, either. It's a little lackluster and generic. Still, it's a solid tune. I dig this energized rocker. It has a lot of that trademark REO sound. It also has some jazzy texture built into it. It's a fun tune with a lot of meat on its bones. A bouncy cut, this has some hints of reggae built into it. It's a bit odd, but catchy and fun. It's also some variety. There is a bit of studio banter at the end of this. A more hard rocking tune, there is a bit of a bluesy edge at times. That said, there is plenty of classic REO along with some of those Head East elements here. This is a solid tune, but not a standout. Energetic and accessible, this has a real classic REO edge to it. It's a precursor to the kind of pop rock that would later propel them to the heights of super-stardom. This is a strong tune that works well. The instrumental section brings some real meat to the meal. I dig the rocking guitar riff that leads this tune out of the gate. The number has more of that mainstream pop rock texture built into it, but there is some real oomph here, too. More of a high energy, no frills rocker, this is fun, but a bit of a let-down compared to some of the rest here. I do like the keyboard solo section, though. The guitar section that opens this is tastefully distorted and so cool. They work out from there to a much more directly blues rock oriented jam. This is bouncy and rather cool. It's a change from most of the rest here and holds up really well. It's one of the highlights of this particular disc of the set. The opening track gets the single treatment here. With Cronin back as the lead singer, they open this album with a song that was destined to become an REO classic. This is hard rocking and so stylish. It really is a signature tune. It features both a meaty (yet catchy) song structure and some killer guitar soloing. A melodic pop rocker, this has a trademark hit-era REO sound. It was definitely the sign of things to come. Personally, I think the tune is a bit lackluster compared to a lot of the rest, but it has "hit single," written all over it. Another pop rocker, this has a bit more meat than the previous cut did. It's a solid tune. It has some particularly tasty guitar work on the outro, too. Now, this has some real meat in the mix. It also has plenty of classic REO sound in the mix. It has some solid hooks and still manages to really rock. I love the keyboard sounds on this tune. The instrumental track later in the cut brings some nearly progressive rock sensibility to it. It features some killer keyboard work and tasty guitar. Another classic REO sounding tune. This is a mellower cut that's a melodic rocker. While this isn't a highlight, the instrumental section later in the track is quite classy. I love the guitar riff that opens this number. The tune is a hard rocking and classy instrumental with a lot of funk built into it. This hard rocker has some real rough edges, in a good way. It brings a bluesy, gritty texture to it. It's a classy cut. While it might not be the best thing here, it brings some variety and character. Another REO tune with a hint of progressive rock, the introduction has some really trippy textures. The cut works out from there to some more mainstream mellower rock, but there is a real dramatic edge to it. This tune is so strong. It is my favorite tune on this disc of the set. At nearly six minutes in length, this track is fairly extensive and quite dynamic, too. Here we get another single version. Here we get a live version of the album's opener. I'm betting you got that from the title and parenthetical, right? This is a strong rendition that perhaps elevates the cut a bit. I love the guitar fills and sound on this. This classic REO tune gets a live telling to start the live album. Richrath's guitar has a real edgy texture to it at times on this, lending some smoking hot hard rock. While I love the mid-track guitar solo, the one later is purely on fire. More of a melodic rocker, this has a lot of energy and fire to it. It is definitely the kind of thing that REO always did particularly well. There is some powerhouse jamming built into the later parts of this tune. This is the same kind of track as the last one. It works well, but doesn't really stand out at all. The tune is harder rocking than the studio version. I really like the keyboard sounds on this cut. The track has a cool balladic approach as it starts. This is more effective than the studio version, I think. It has some good growth built into it. This is a second longer than the version included as a bonus track on the previous CD. It's not largely different beyond that. In both cases, this is a killer REO tune and a great live rendition. I'm not overly crazy about this live take. While the original rendition was rather generic, this one seems even more pop dittie based than that take. Still, it's to be expected that there are some songs that are less effective than others. There is some killer instrumental work later in the track. A balladic styled cut at the start, this has some cool hooks and textures. It gets more rocking as it works its way forward, and this live take is strong. The instrumental break later includes some killer keyboard work and tasty guitar lines. This is another energized rocker that has some tasty melodic elements built into it. The instrumental section later is so cool. It allows a showcase for just about every instrument. They break out into an intense version of the main musical themes as they come out of there, too. This live take of the instrumental from the last album gains a bit more of an edge. This runs straight into the next cut. As advertised, Richrath gets his guitar solo here. It's a powerhouse jam that has a lot of killer rock and roll shifts and changes built into it. There is a little bit of "Ghost Riders in the Sky" built into this. He manages some different flavors and moods along the road, too. A killer piano solo opens this live version of the track from the debut album. They add a lot of fire and fury into this, really elevating the cut from the original studio take on it. I dig the fact that there is a bass solo in the midst of the cut. The call and response dueling vocals and guitar between Cronin and Richrath is legendary. This used to really get a lot of airplay, and a large part of that was that section. This thing is purely on fire as it works out from there. This live cut became the band's first hit. It was also all over the radio in the 1970s. Starting with synthesizer, this rendition is so much more powerful than the studio take. The pace is a little speedier and the sound is just meatier. There is some smoking hot instrumental work on the final section of the track. There's no question why this made so many waves. It's an amazing performance. This is a bit of a let-down from the number that preceded it. Still, this is a fun rocker that has a classic REO sound. It's more the REO that is to come whereas "Ridin' the Storm Out" is the REO of the past. Here we get a live take on REO's take of the Chuck Berry tune. I have to say that in this case, I think I prefer the studio version of the track. This does have some killer piano work in it, though. I love Richrath's soloing, too. The live disc is closed by my favorite REO tune. As much as I love the studio rendition of this cut, I think this live take is even more powerful. The proggy elements are still all over this, and the cut does such a great job of conveying the balance between the softer and harder rocking movements.